Ken Avery begins his 16th year as Gardener. Note: All issues of the Friend’s Newsletter, The Fringed Gentian™, were numbered out of sequence this year. The correct volume numbers are used in the text. The "as printed" numbers are shown a the bottom of this page. 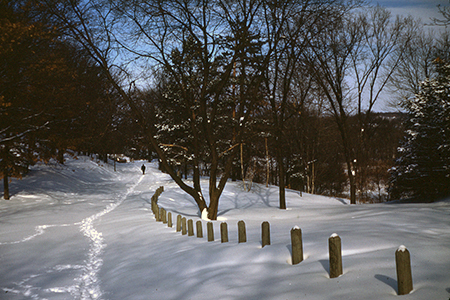 A snow covered path near the Garden that Ken Avery refers to as becoming a popular ski area. In The Newsletter, (Vol. 22 No.1 Jan 1974), Gardener Ken Avery reported on visitors to the Garden area during the winter. “Today, January l, 1974, as I write this it is -30°. We have broken the record for low readings three days in a row and it is supposed to be cold again tomorrow. Last Sunday when it was about 0, my wife and I went to the Garden to fill the bird feeders. Since it was so cold we parked at the south end, rather than at the Spring, to make a quick trip of it. One car was parked at the gate when we arrived there. As we left our car another car pulled up with two young men with skis. When we left, just thirty minutes later, there were four other cars in the parking spot. At the top of the hill there was a family skiing; while I was filling the feeder some skiers went by; we met two skiers at the back of the Garden, two skiers coming down the hill from the hayfield, and two more skiers as we left the hayfield. (Skiers seem to run in packs of two.) [Ed note: The 'hayfield' would appear to be the open grassy area to the north-east side of the Garden which descends quickly to the level of the marsh behind the Garden]. I can't help but compare this with the first few years that I had the Garden. In those days you could spend hours in the park during the winter and never meet anyone. Starting about 1965 a few people started discovering how beautiful the Park was in the winter and with the rise in popularity of Cross-Country Skiing in the last few years, the winter seclusion of the area has almost vanished." Burgess Fountain at the front gate. Witt Fountain in front of the Shelter. It was reported that two members of the Friends of the Wildflower Garden have died recently - Mr. Alvin R. Witt and Mrs. Gerald Burgess (Louise). Mr. Witt had been a member since 1961. In may of 1973 he was made an Honorary Member in recognition of his valuable services as acting treasurer during the fund drive and construction of the Martha Crone Shelter. When the Volunteer Host and Hostess program was started, he spent many hours at the Garden talking with the visitors. Friends and relatives of Mr. Witt contributed a considerable amount of money as memorials to the Friends of the Wildflower Garden. Mrs. Burgess died October 10, 1973 in California where she had lived since 1965. She had organized and counseled family-life groups in Minneapolis more than forty years and wrote a column entitled "Let's Be Better" for the Edina Courier from 1950 to 1960. She was also an author, her first book being This side of the stars. Louise was a member of the Friends until her death. Both Families have a similar family related memorial in the Garden, that being a water fountain. 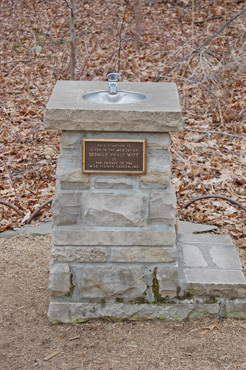 The Witt fountain is located on the patio area in front of the Martha Crone Visitor's Shelter in the Woodland Garden, given by The Friends of the Wild Flower Garden in memory of Bernice H. Witt, Alvin’s wife. It was installed in 1971. 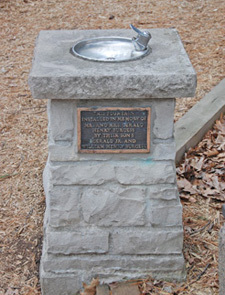 The Burgess fountain is located just inside the front gate of the Garden, installed in 1986 in memory of Mr. and Mrs. Gerald H. Burgess and presented by their sons. 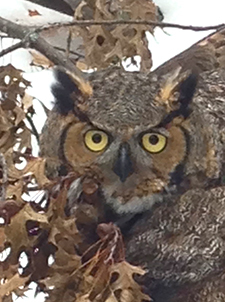 Great Horned Owl at Eloise Butler Wildflower Garden. Photo from 2014, ©Al Jueneman. A board of directors meeting of the Friends was held in the Martha Crone Shelter on April 8. Gordon Morrison, Co-ordinator of Environmental Education of the Park Board and Gary Crider, Landscape Architect of the Park Board were present and it was discussed how to proceed with a revised plan for front steps and handrail leading to the Garden and then a bulletin board and bike rack at the front gate. More definite plans were to be forthcoming. 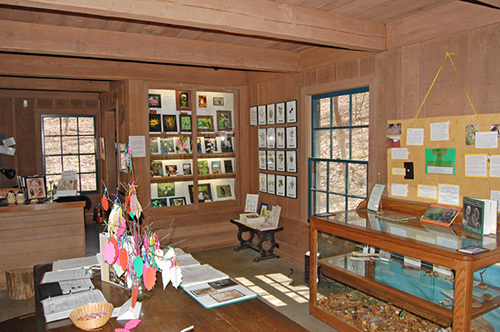 The Annual Meeting of The Friends of the Wild Flower Garden was held in the Garden, on Saturday May 11th, 1974, in the Martha Crone Shelter, 29 people attending. The morning was dark with drizzling rain, which began to clear as the meeting was ending. Kenneth Avery gave his report of the status of the Garden. Ken also demonstrated an alarm system that could be linked between the Shelter and the Gardener’s shed. The Garden received a small trailer from the Rose Garden that would be used with the Garden Tractor that the Friends had purchased 3 years ago. Membership totaled 260 but some had not paid membership dues so Mildred Olson sent a special letter to 30 "2-years lapsed" members. She actually got replies - 14 paid, 6 expected to and the remainder had either died, moved or did not respond. Dr. Marian Grimes reported on the shelter volunteer (hosts) program which had 20 volunteers at that date. She also requested someone to help with the duties of recruiting volunteers. Later, Evie Chadbourn and Lynn Deweese agreed to help. Betty Bridgman, Marion Andren and Mrs. Mildred Haglin were the nominating committee for the Board of Directors slate. Directors elected were: Jean Chamberlain, Evie Chadbourn, Alexander Dean, Robert Dassett Jr., Marie Davidson, Dr. Marian Grimes, Catherine Faragher, Bruce Hooper, Leonard Odell, Mrs. Mildred Olson, Wilber Tusler. Following the election, Leonard Odell resigned in favor of his sister Moana Beim. The list of Ex-officio members: Kenneth Avery, Dorothy Binder, Catherine Faragher and Walter Lehnert, same as the previous year. The Honorary Board Membership list this year was: Moana Beim, Marion Cross, Dorothy Binder, Russell Bennett, Mrs. C. M. Case, Whitney Eastman, Mrs. George Ludcke, Henry Neils, Leonard Odell, Leonard Ramberg, Mrs. Clarence Tolg and the Martha Crone as honorary life member. Former Board member Harry Thorn was not nominated as he was moving to Virginia. There was a board discussion of using funds of the Friends to do “things” for the garden. Except for buying the Garden Tractor in 1972, building the Shelter in 1969/70, the Friends had previously just donated money to the Park Board to be used for the Garden. These ‘things’ would of course need Park Board approval. The tape deck that had been stolen last year was replaced by the Friends at a cost of $130. The chain saw, stolen last year, was also replaced in the Fall. The display case lighting was installed later in the season - see notes in the Summer section. At the Board meeting following the annual meeting, Mildred Olson resigned as Secretary-Treasurer and newsletter editor due to health reasons. New officers elected were: Robert Dassett Jr., President; Moana Beim, 1st Vice President; Alexander Dean, 2nd Vice-president; Marie Davidson, Secretary-Treasurer. Marie Davidson also took over the duties of editor of The Fringed Gentian™, for the Summer and Fall issues this year. She also took over membership duties. 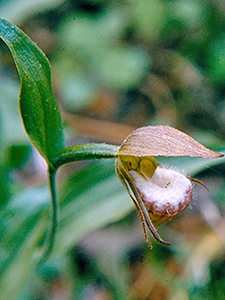 Stemless Pink Lady's-slipper (Cypripedium acaule) ©G D Bebeau. The Summer issue of The Fringed Gentian™ (Vol. 22 No. 3, July 1974) contained a report of the Friends Annual Meeting referenced above. 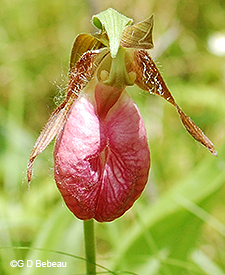 The Showy Lady’s-slipper just began to bloom on June 18th, the latest date ever in Ken Avery’s records to-date but not as late as June 21 in 1936 and June 28 in 1945. “Last year while at Itasca Park, a friend who lives in Bagley gave us a personal tour of Northwestern Minnesota and at the end of the tour stopped at the Kingsburys to introduce us. The Kingsburys have a rock and gem shop 6 miles north of Bemidji, and I must say an excellent one; but we stopped to see his garden. Mr. Kingsbury grows Pink Stemless Lady’s-slippers and Ram’s-head Lady’s-slippers with the ease and success most people reserve for petunias. He actually has beds of these impossibly difficult flowers growing and thriving in his lawn. I have never seen anything like it!" Ram's-jead Lady's-slipper (Cypripedium arientinum). Photo from a Kodachrome taken by Garden Curator Martha Crone on June 9, 1954. The Friends held a board meeting on July 29 at Perkins in Edina to discuss what things needed to be replaced in the Shelter. The tape deck had been replaced but the display case lighting, the alarm system, the fireplace heating, were all still in flux. The Friends did approve installing in the shelter flood lights to illuminate the display cases. The display lights were installed for the cost of labor - $361 - by Hoffman Electric, who donated the materials and their overhead. Photo in the Spring section. 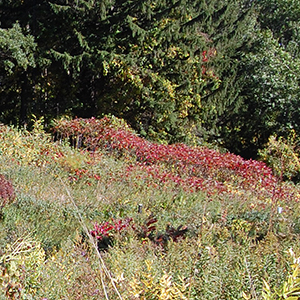 An infestation of Sumac in the Upland Garden, as much a control problem today as Ken Avery writes about in 1973 and 1974. Photo from 2013, ©G D Bebeau. In his report in The Fringed Gentian™, (Vol. 22 No. 4 October 1974) Gardener Ken Avery wrote the following about why the Garden is full of poor broken, dead, and dying shrubs. Friends President Robert Dassett wrote that this was a beautiful time to visit the Garden and encouraged all members to do so. At a Friends Board meeting on Sept. 19th at the home of Mrs. Beim, the board decided to get a professional heating engineer to recommend a fireplace solution. The heating fix would eventually be attacked by the addition of glass doors and a fan at a cost of $600. Also, it was voted to replace Mr. Avery’s chainsaw, but the cost to the Friends for that has been lost in the records. There was also discussion about raising the Friends minimum membership above the current $3.00 per year. Eloise Butler was her mother’s favorite cousin, and this Eloise was named after her. Eloise Riggs lives in Malden Mass. where Eloise Butler’s sister Cora Pease lived and where Eloise Butler visited during the Winter months when the Garden was closed from 1910/11 to 1932/33. 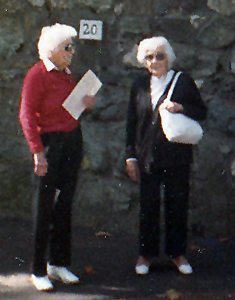 She is pictured in a photo on this page outside the Cora Pease house in 1988 and also in this article about the Malden House: 20 Murray Hill Road.